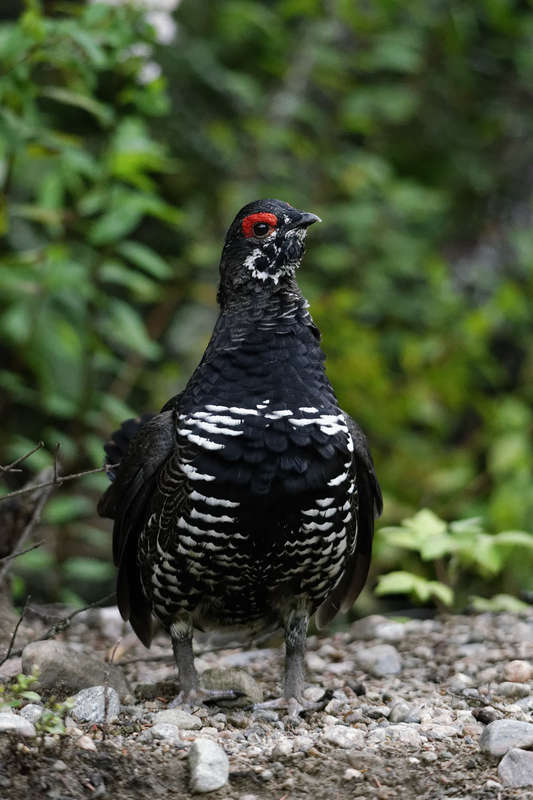 This splendid chap is a Spruce Grouse (Falcipennis canadensis); according to my bird book, it is also known as the Fool Hen, due to its habit of allowing people to get extremely close before it beats a retreat. Male moose, with early-growth antlers. 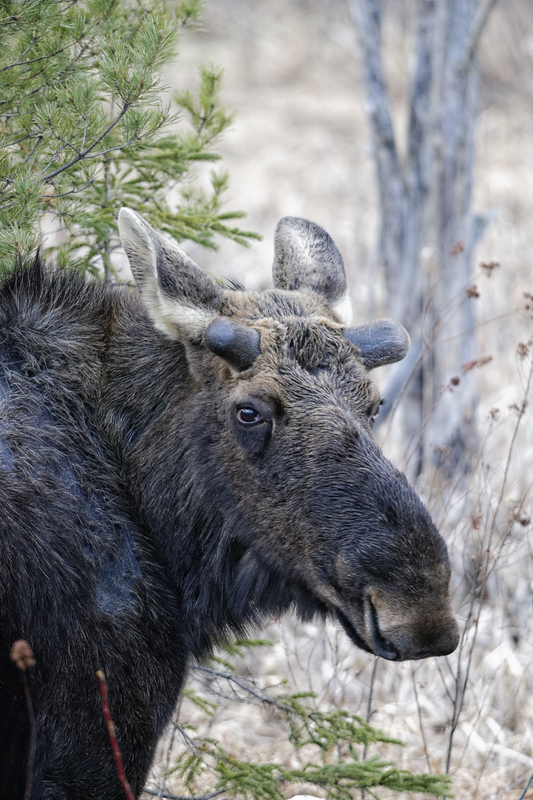 Alces alces, the moose, is the largest of the deer family (that hasn’t gone extinct). Seeing a wild one was very high on my list of things to do in Canada; after two and a half years, I was still failing miserably. This all changed on a visit to Algonquin Park, as the winter snow was in the process of melting; the main road through the park has an awful lot of salt put on it during the winter, to help keep it open and in the spring, the salty water around the roads attracts moose – short of sodium after the long winter. Having failed to see a single moose in two and a half years, we almost got into double figures in two days – a thoroughly memorable couple of days! Moose are really rather splendid creatures, although ours were looking a bit scruffy, having just survived a really rather horrible winter. Apparently, moose are unusual in that their noses can close when submerged, making them the only deer that can feed under water. When one lives about an hour’s drive from Niagara Falls, one tends to end up visiting the place quite a lot, with extra visits whenever one has guests from out of town. The first time I saw the falls with adult eyes, I was expecting to be a bit underwhelmed: as has been frequently observed by others, the world’s greatest wonders are prone to appear so frequently in books and films etc that it is easy to expect them to be bigger and more impressive than they really are. Despite all that, Niagara Falls is still jaw-droppingly impressive and remains so, no matter how many times I visit. This shot of the American Falls was taken from the US side of the river, whilst taking a day trip out of the country as part of getting PR. Despite it being May, there was still some snow on the ground – in indication of how fierce the winter had been. I think groundhogs (Marmota monax) are brilliant! If you’re from North America, these things are relatively unremarkable, apart from their alleged weather-predicting abilities (! ); not having anything like this back home, they’re rather more impressive to a Brit. This particular individual was part of a pair that live in amongst the big rocks that make up the lake-shore about half a kilometre east of Oakville Harbour.